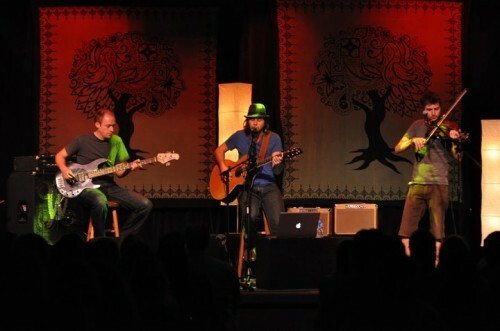 The concert’s set list included 9 songs from Photoside’s debut album, The Beauty of Innocence Remains and new material from an album whose creation is in progress. The upcoming concept album is forged from a trilogy performed for the first time during this concert, and is focused on internal spiritual change. Its message is the progression of what we go through in life, dealing with life’s conflicts. The overall effort of the concept album will be anchored around these 3 acoustic songs, with an additional 2 to 3 songs dealing with the message of each piece of this trilogy. The opener, ”Black Heart”, provided a dramatic entry to the evening with a song whose breaks give way to the emotional depth of the song. With a refrain pleading for Christ’s love to enter our lives, ‘I’m in over my head, set my soul free’, this song speaks to the longing of all Christians. The light rocker, “When Beauty Sings”, showcased Marshall’s emotion filled voice, setting the stage for one of the best covers I’ve witnessed of The Beatles “Come Together”. Here, the 3 piece acoustic shined despite a lack of percussion, highlighted by the violin replacing the sometimes violent lead guitar with synth-laden lead making this version distinct and highly memorable. “Despair”, the first of the new trilogy, is a softly performed song telling the story of one’s early hope crushed by the daily pressure of life leading to despair. Well placed in the set list was the song “Don’t Care”, which shares a conversation between man and God where man asks ‘Do we have a little love left in this place, can we give a little heart to the human race?” And God’s reply, ‘You know that I want you by my side, just take my hand. You need to know that you’re beautiful to me’. The slower, heart-felt “Sweet Fascination” brought out the crowd’s interaction just in time for “Welcome Home”, a powerful message of social justice. A well-played bass accented the acoustic guitar, while a superb violin solo lead to a tempo change making the listener feel as if they indeed had been welcomed home.